The human body is made up of trillions of “building blocks” called cells, each of which is fully able to perform all the processes that define life - respiration, energy production, movement, digestion, elimination, reproduction, etc. Just as the foundation of health is only as strong as its building blocks, we are only as healthy (or unhealthy) as our cells! Cells are like miniature bodies in that they need to take in nutrients and eliminate wastes in order to stay healthy. 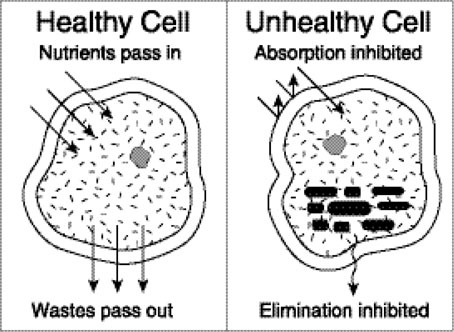 Luckily, each cell is surrounded by a membrane which acts as a vigilant gatekeeper: Only those nutrients needed by the cell at a given moment are allowed to enter, and only waste material and metabolic products are allowed to leave. Maintaining this selective, discretionary power is crucial to cellular health and vitality. Cells that cannot properly assimilate nutrients or eliminate wastes could be respectively described as “starved” or “constipated”! When such conditions exist, cells may become toxic and “sluggish” instead of healthy and vital. Sluggish cells are unable to efficiently produce energy for life or perform their other specialized jobs. Lipids, sterols, amino acids, and other nutrients can help your cells maintain the discretionary power so important to their health. And if your cells “feel better,” so will you! At GNLD, we have an intimate understanding of the complex workings of cells, and since 1958 we have used that knowledge to create dietary supplements that are aimed at cellular nutrition. By supplying essential links in the “Chain of Life” and by fully addressing each of the “Six Stages of Nutrition,” our products have established the global “gold standard” for cellular nutrition. Based in Nature and backed by Science, GNLD supplements provide comprehensive nutritional support. Our goal? We want to help your cells become the finest building blocks possible. If we succeed, your foundation for optimal health will be strong. To your health!